People stand by the site of a suicide bombing in Medina, Saudi Arabia, on July 4. Those who claim that terrorism committed in the name of Islam has "nothing to do with Islam" received much ostensible fodder by way of the recent spate of terrorist attacks in Bangladesh, Iraq, and Saudi Arabia in the closing days of Ramadan. Because these three countries are overwhelmingly Muslim majority, the talking heads are now sure of it: the terrorists are just that—terrorists who have nothing to do with the religion of Islam, which in fact bans the indiscriminate slaughter of fellow Muslims. Maher Zain, a Multi Platinum-winning singer and songwriter who is Muslim, wrote on Twitter to his 1.47 million followers: "Still need proof that ISIS is the foremost enemy of Islam? They attack the Prophet's City. Terror knows no religion!" Boxer Amir Khan tweeted to his 1.75 million followers: "The attack in our beloved Prophet Muhammad's city Madinah proves that Isis has no religion!" The UK Muslim broadcaster Mohammed Shafiq wrote: "The attack on #Madinah was an attack against all Muslims." After Islamic State jihadists screaming "Allahu akbar" murdered twenty hostages at the Holey Artisan Bakery in Dhaka on the night of July 1, the serially deceptive Islamic apologist Qasim Rashid tweeted: "In #Ramadan's final 10 days, Daesh has mass murdered dozens in three Muslim majority nations Please tell me more about how Islamic they are." In another tweet, he included a photo captioned: "So you're telling me they killed Muslims during Ramadan and you still blame Islam? Are you that incompetent or that bigoted?" To that, Rashid added: "Likewise, how I feel when I hear Islamophobes claim Islam was somehow behind the #DhakaAttack." Echoing Rashid was no less illustrious a personage than Bangladesh's Prime Minister Sheikh Hasina, who insisted: "Anyone who believes in religion cannot do such act. They do not have any religion, their only religion is terrorism." Speaking after the San Bernardino terror attack that left 14 dead, U.S. president Obama—who also insists that the Islamic State "is not Islamic"—agreed with the above sentiments: "ISIL does not speak for Islam. They are thugs and killers, part of a cult of death... Moreover, the vast majority of terrorist victims around the world are Muslim." Is that the case? Is it that simple? In fact, from the start of Islam, Muslims have been relying on the same rationalizations to justify the slaughter of other Muslims. First, it should be noted that the jihadis are aware that they should not randomly kill fellow Sunnis. This was the case in the Bangladesh attack. With police fire whizzing over their heads, the jihadis still managed to question their hostages, releasing those that could verify they were Muslim and killing those who could not. As documented here, jihadis around the world—in Libya, Kenya, Mali, Nigeria—regularly follow the same protocol of separating Muslims from non-Muslims before slaughtering the latter. Thus the Bangladesh attack does not count. Mainstream Sunni Islam views Shias and other non-Sunnis as false Muslims. This is the logic behind the terror strikes in Karada, a Shia neighborhood in Iraq, and the bombing in Saudi Arabia's Shia majority Qatif province; they were both undertaken under the same exact logic as when Christian minorities, or European, American, and Israeli citizens are attacked and killed: all are infidels who must either embrace the true faith, be subjugated, or die. As for Sunni on Sunni violence, this is easily justified when one group engages in takfir, and thus denounces another group of being kafir—that is, non-Muslims, infidels, whose blood can be shed with impunity. Takfir has existed alongside Islam almost from its inception, beginning with the khawarij (Kharijites)—who denounced and slaughtered fellow Muslims for not following the letter of law—and was the primary rationale used to justify jihad between different Sunni nations and empires throughout the centuries. Jihadi groups regularly denounce Saudi rulers as apostates, mostly for their close relationship with non-Muslim powers. This explains the attacks on the American ("infidel") consulate in Jeddah. Jihadi groups regularly denounce the Saudi rulers as apostates—not true Muslims—mostly for their close relationship with non-Muslim powers like America; this charge goes all the way back to Osama bin Laden, who, though radicalized by Saudi education, ended up denouncing the monarchy for allowing the U.S. military to be stationed in the Peninsula. 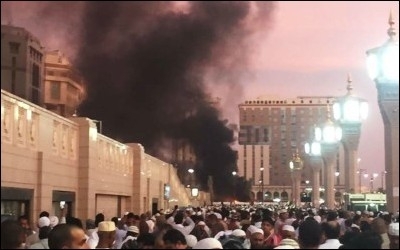 As for the attack near the prophet's tomb in Medina—which seems like a direct attack on Islam itself—the fact is strict Islamic teaching ("Wahabbi" and "Salafi") condemns and seeks to purge all tombs of prophets, which are seen as promoting shirk, the sin of sharing in Allah's glory. This is why the Saudi government itself has sought to destroy the prophet's tomb. In short, to Sunni jihadis, non-Sunnis are heretics and thus free game. As for fellow Sunnis who get in the way, they can be pronounced apostates and attacked accordingly. As for true Sunni Muslims, the jihadis should try to separate them from the intended infidel target—as happened in Bangladesh and elsewhere—but if they die accidentally, they are martyrs ("and the obligatory jihad should never be abandoned because it creates martyrs"). The argument that jihadi organizations kill fellow Muslims proves nothing. Muslims have been slaughtering Muslims on any number of justifications and rationalizations from the start: So what can the open non-Muslim—such as the Western infidel—expect?